kraftomatic: One of a Kind, cont'd. Sure, amateur Obama art isn't hard to come by these days. But every once in a while, a truly special presidential painting goes on the market. Friends, this is one of those times. For just $300, this unique spray paint and watercolor creation could be yours. 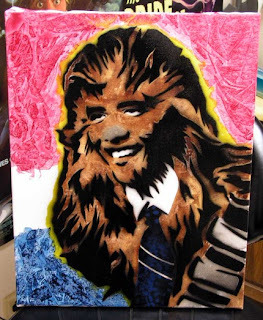 Says the seller: "The coolest president meets the coolest wookie." I think we can all agree on that much, at least.